David is working on building a dedicated new studio for his work, along with three eco studio retreats for holiday lets. This building project is due to be completed by September 2018, and until then David will not be able to lead any workshops. Apologies if you were hoping to book on a workshop this year, but keep in touch, as we will be taking bookings next year. David uses an informal approach to the workshops and the emphasis is on the student exploring their own creative language, enjoying the experience of making and ending up with something that is personal to them. Students are encouraged to bring along small sentimental objects that may possibly be incorporated into the piece they are making. All other materials and tools are provided for the day. "What a treat! 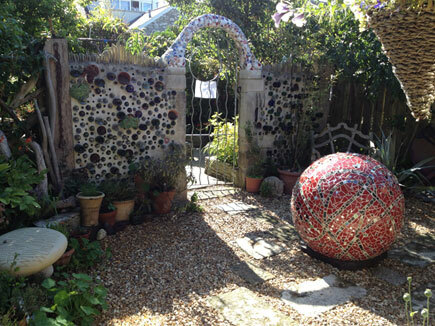 David organised a fabulous mosaic workshop for my hen party. 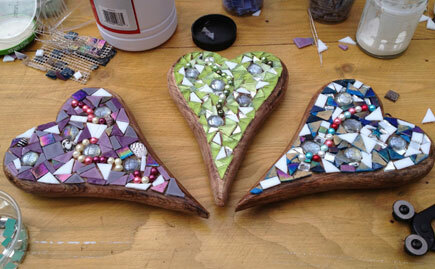 What a stimulating setting to be creative and make beautiful mosaic hearts. Thank you for going the extra mile!" - Dawn Larrett, workshop participant. Full day, part day and evening courses available. Full day course or two evening courses: Make a mosaic two sided hanging light catcher for your home. Part day or one evening course: Make a one sided mosaic wall hanging for your home. A group event makes for a different way to celebrate that special occasion, either a birthday, a marriage or just a social get together with friends or family for a day. Why not combine it with lunch in the cafe or a cream tea in the garden? Get 10% off group booking of parties of four to eight people and also 20% off your food bill in White Stones. Please contact David via email if you have any questions and would like to book a place on a workshop. Create a two side mosaic hanging light catcher. Create a one side mosaic wall hanging. All courses include tea, coffee and biscuits at the start of each course. On the full day course there is an hour break for lunch. Anyone taking part on the full or half day course will receive a 20% discount voucher if you wish to have lunch at White Stones. Cash is payable on the day and it is essential that you arrive to be ready for a 9.30 start. Group bookings of 4 - 6 people will receive a 10% discount. Spaces are limited so book early to avoid disappointment. Please call us on 01305 561597 or e-mail us for more details.